Granny - what would we do without her? Here are grandmother quotes and poems to shower her with love. Some are funny, some are inspiring and they are all great - because Grandma is great! Call her: Grandmother, Grandma, Granny, Nana, Oma, Gram, Grammy, Gramms, Mimi, Nona, Abuela, Abuelita, Mamaw, Yaya, Bomma or any other name - she'll always be the best! Of course all these verses can be used for great-grandmothers, too! a photo showing grandma/grandparents and her/their grandchild(ren). Then put it in a frame and give as a gift! Custom art: Have one of these quotes professionally printed as wall art to give as a gift to granny. Mimis never run out of hugs or cookies. A grandmother is a little bit parent, a little bit teacher, and a little bit best friend. Grandmas hold our tiny hands for just a little while. But our hearts forever! Grandma has ears that truly listen. Arms that always hold. Love that's never ending. And a heart that's made of gold! Just when I thought I am too old to fall in love again - I became a grandmother /grandparent! A grandma makes time. Keeps faith. Shares wisdom. Shows patience. Gives joy. And she lives love. Without my grandchild(ren) my house would be clean and my wallet would be full, but my heart would be empty. A grand baby is a bit of stardust blown from the hand of God. You've got the whole world in your arms when you hold your grandchild. Kisses and cuddles, cookies and treats, days spent with grandma are always so sweet. Grandmothers and roses are much the same. Each are God's masterpieces with different names. I have a guardian angel in heaven, I call her granny. A granddaughter fills her grandma's heart with rainbows. Grandma can see what's invisible to the eye because she looks with her heart. A grandmother is a babysitter who watches the kids instead of the television. Grandmas are moms with lots of frosting. Grandmas love little handprints everywhere. Mommy knows a lot. But Grammy knows everything! If life is a roller coaster, being a grandma is the whole amusement park! I don't have to say 'no'... I'm the grandma! Keep calm... and hug your grandchildren! Mimi - because you are way too cool to be called grandma! T.G.I.F- - This granny is fabulous! You know you're a Grandma when... you used to get angry at your kids and now you laugh when your grandkids do the same thing! 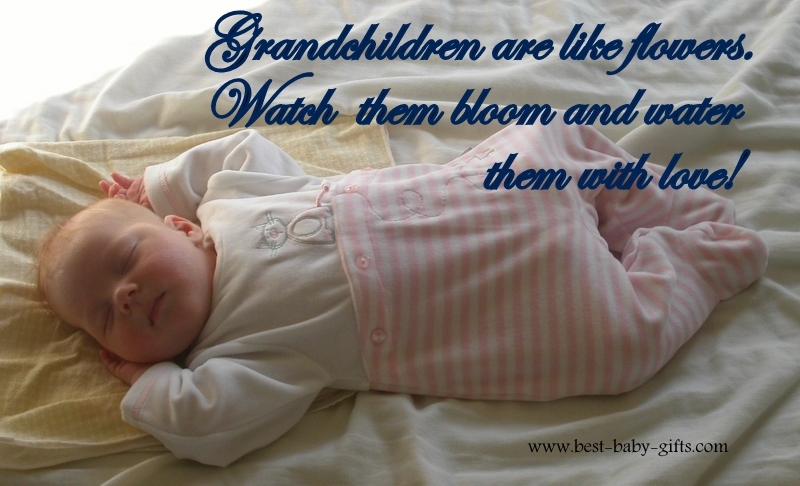 A grandma is a parent - but with more sleep, fewer rules and an endless supply of cookies! Only the best moms get promoted to grandma! Grandmas are good at hugging because they've had years and years of practice! There's not place like home. Except for Grandma's! Grandmas never run out of hugs or cookies. Is one in a million to us! You are the child of my child, and your life is a joy to me. I am grateful to have you in my life. As I watch through the generations, I am reminded that the bonds we form are as everlasting as the spirit. precious little angels, to cherish and love. a handful of happiness, a heartful of love. Grandma, hold me a little longer, rock me a little more. Tell me another story (you've only told me four!). Let me sleep on your shoulder, I love your happy smile. I'll always love you, Grandma, so stay with me a while. Grandmas are really nice ladies who always make you feel good inside. They read you stories and there is fun things in grandmas' houses. You can take out all the pots and pans at once and make tents with blankets. Some people say that grandmas spoil kids rotten. Not my grandma. She says only eggs get rotten. The world is a good place because of grandmas. that will last a whole lifetime. If I have my grandchild on my mind, I am happy. If I have my grandchild talk to me on the phone, I am even happier. But if I have my grandchild in my arms, I am the happiest person in the world! and the keeper of my heart for all eternity! Tips from a 'real' grandma such as activities to do with your grandkids. Enjoyed my collection? 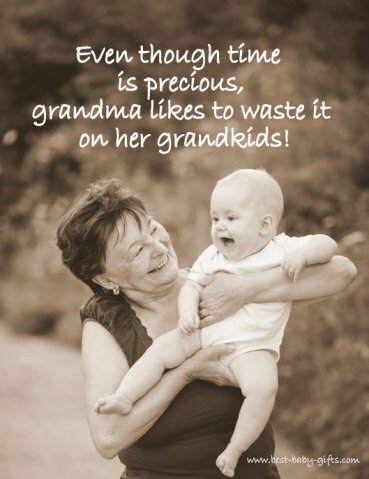 Know some more cute or inspiring grandmother quotes? Let me know and I'll be happy to add them here so others can benefit, too. Please use the 'contact me' form to submit your entries. Thank you. 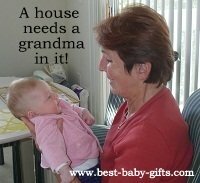 Gift ideas from baby to give to grandparents.